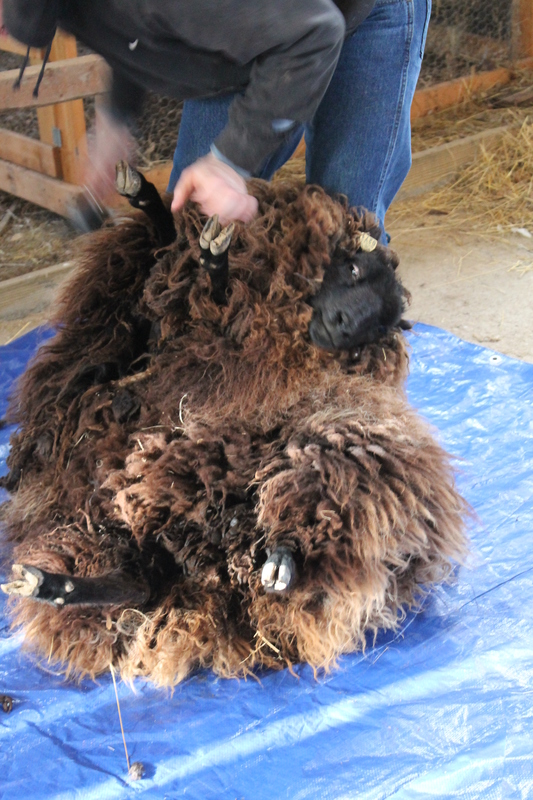 Most sheep have to have their wool shorn off at least once (sometimes twice) a year. If they aren’t shorn (or sheared) then they will get very hot and uncomfortable in the summer. Some types of sheep will shed their wool in the spring (this is called “rooing“) but its usually faster and easier for the shepherd to cut or shave the wool off all at once. Some shepherds shear their sheep themselves and others hire professionals to do it. Professional sheep shearers can shear dozens or even hundreds of sheep in a day! The first step in shearing the sheep is to make sure that they are dry and not too dirty. That means that if its going to rain right before shearing, they need to be kept in the barn. Some shepherds prefer to keep them in the barn the night before shearing even if its dry so that they don’t eat too much grass. 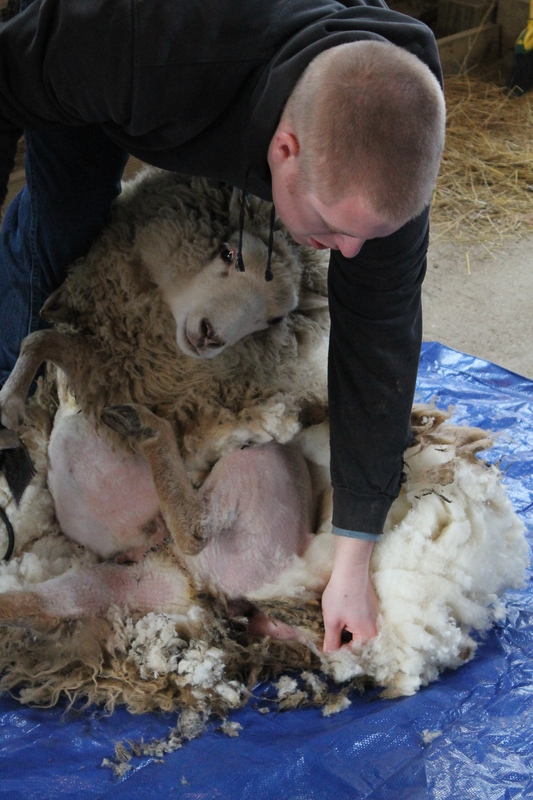 If their bellies are too full during shearing it can sometimes give them an upset tummy. It is best not to have a lot of hay or wood shavings or other messy things for the sheep to get into before shearing to make it easier to keep the wool clean. Next, the flock needs to be gathered in a pen so that its easy to catch each one and lead it out for shearing. This process is called “rounding up” or “mustering” the flock, and they are put in a “catch pen“. 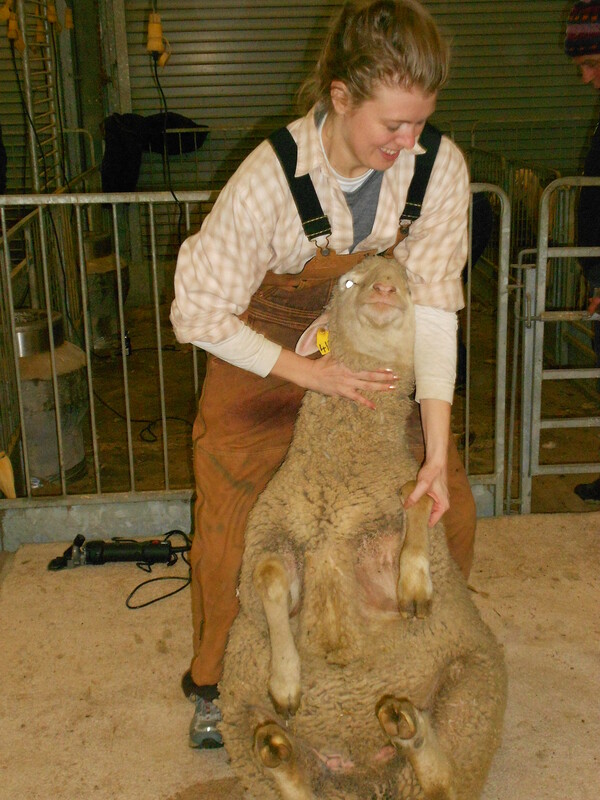 There are two main styles of shearing. With “stand shearing” the sheep is tied to a shearing stand so that the sheep is up off the ground and the shearer doesn’t have to bend over as far. This is especially nice for very short sheep and/or for shearers with back problems. With this style of shearing, the sheep stands still on the stand for the whole process and the shearer moves around the sheep to get to the different parts of the fleece. In other style of shearing, the shearer sits the sheep on its hip and supports its weight while bending over. The shearer moves the sheep around to get to the different parts of the fleece, all while holding and supporting the sheep. This method can be very fast but it also requires a lot of experience and physical strength. The shearer has to hold the sheep in just the right position so that the sheep will relax and not struggle. Becoming a skilled shearer using this method can take years and many hundreds of sheep! Either style can be done with “blades” or with “shears“. “Blades ” are like scissors. In fact, some shepherds use regular scissors and others use special blades made for shearing sheep. “Shears” are electric shaving tools. They are similar to an electric razor that a man might use on his face, but much bigger! Most professional shearers use shears because they are very fast. I usually use blades because they are easier for a beginner to use and result in fewer injuries when the shearer (Me!) is unexperienced. 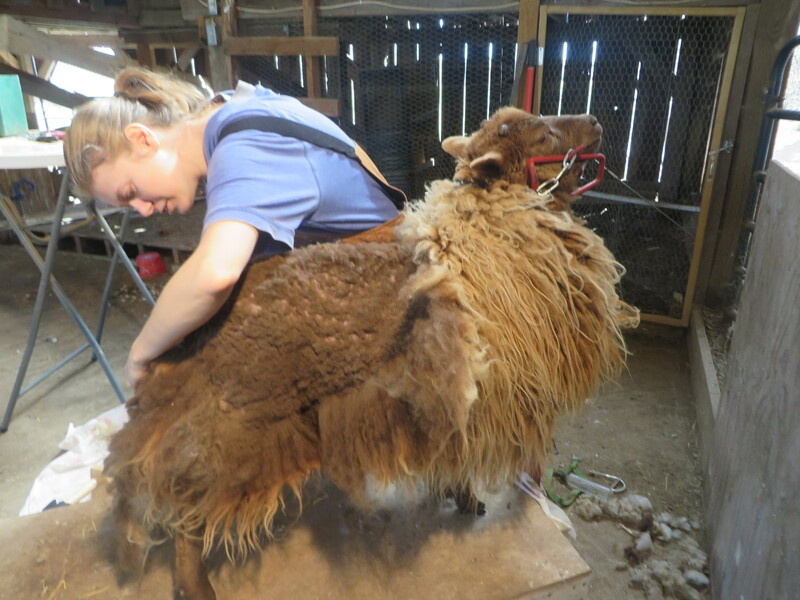 Shearing is often a good time to check the sheep to make sure they are healthy, trim their hooves and give them any annual medications that they might need. On Square Peg Farm, we use the Stand Shearing method and use Blades.